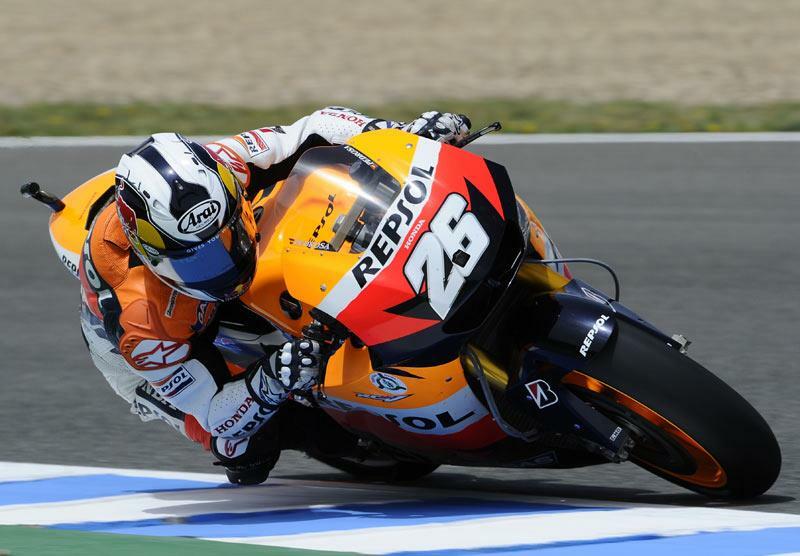 A rejuvenated Dani Pedrosa stormed to a shock pole position for his home race in Jerez tomorrow after a thrilling qualifying session for the Spanish MotoGP race. Just over one second split the top 11 on the grid but the field being headed by Pedrosa’s Repsol Honda RC212V was the first big shock of the 2010 campaign. The Spaniard had appeared stuck in a crisis going into this weekend’s Spanish MotoGP, with the triple world champion struggling to master handling on his factory V4 after he slumped to seventh in the season's opening race in Qatar. But a new chassis with revised stiffness seems to have galvanised Pedrosa, who has been on the podium in Jerez every year since 2005. He clocked a best time of 1.39.202 in the final four minutes to beat compatriot and bitter rival Jorge Lorenzo by 0.285s. Fiat Yamaha rider Lorenzo was always a contender for his third successive MotoGP pole position in Jerez but his best lap of 1.39.487 was only good enough for second. Factory Ducati rider Casey Stoner bounced back from his late crash in practice yesterday to claim the final place on the front row of the grid. The Aussie logged a best time of 1.39.511 to claim third in the final two minutes. A late charge on soft Bridgestone tyres failed to secure Valentino Rossi a front row slot as the Italian had to settle for fourth place. The 31-year-old led for long periods in the hour-long session before his on-going right shoulder injury looked to be taking its toll as he dropped down the rankings to sixth. A best lap of 1.39.558 on his final lap though elevated Rossi to fourth and he missed the front row by just 0.047s. Nicky Hayden restored some of his battered confidence with a brave ride to fifth. The American had suffered a monstrous crash during this morning’s second free practice session and in the early stages he found it difficult to find any consistent speed. But a lap of 1.39.560 put Hayden in fifth on the grid as he was ended just 0.002s behind Rossi. Randy de Puniet put in another impressive performance to finish second Honda with a lap of 1.39.591 securing him sixth on the grid. The Frenchman had put the LCR Honda machine as high as second at one stage. Monster Yamaha Tech 3 duo Colin Edwards and Ben Spies will start next to each other on the third row. Edwards recovered from a sluggish start on his YZR-M1 machine to log the seventh best time. The Texan’s best of 1.39.970 edged out Spies in eighth by 0.019s. Qatar podium finisher Andrea Dovizioso was ninth with Marco Melandri rounding out the top ten.